Poop piling up in your yard? No one wants to get stuck with that “dooty” of picking up the mess. Don’t worry, you don’t have to bend over backwards (literally) to scoop the poop. There are other tools you can use besides your hands to clean up this mess. Keep reading to get the scoop. Nature’s Miracle Jaw Scoop is our #1 pick in our Best Pooper Scooper Reviews. You can pick up your dog’s waste and put it in a bag or container to keep your yard poop-free. This scoop doesn’t require you to bend over and pick up the poop, so if you have a bad back (or just don’t want to bend over) this is a great scoop for you. Nature’s Miracle comes in two sizes and the Jumbo size is our pick for best pooper scooper for large dogs and the Medium size is the best pooper scooper for small dogs. The grass style of this Dogit Jawz Waste Scoop makes it easy to scoop your dog’s poop up from the grass. Without bending down you can collect poop from the grass whether it’s in your backyard, at a park or when you’re traveling. The scoop has sharp, jagged teeth which makes it easy to scoop poop. These Earth Rated Poop Bags are our pick for Best Dog Poop Bags. We’ve all taken our dogs on a walk and then had to carry it and smell the unpleasantness inside the bag until we’ve reached a trash can. Earth Rated bags are available in a lavender scent to help cover the smell which is greatly appreciated by many dog parents. These are not branded as biodegradable dog poop bags but many customers think that they are. So, we don’t see this as a con because we couldn’t find any poop bags that meet the U.S.A.’s biodegradable regulations. We’ve chosen the Doggie Dooley Septic Tank as the best dog waste composter. When you’re clearing your yard with one of the pooper scoopers above you can drop the waste directly into this dog poop composter. Don’t Forget To Scoop The Poop! 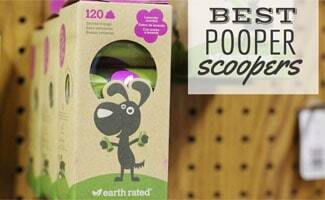 Whether you buy a scooper or not, please remember to pick up your dog’s poop! (As you don’t want to end up like this poor guy). If you notice while scooping any discoloration in your dog’s poop, you should read our article on what does dog poop color mean. And if your dog is eating its poop, well then that’s another story and you need to check out our article on why do dogs eat poop. Lastly, if you don’t feel like picking up your dog’s poop, consider a pooper scooper service! What are your #1 products for taking care of your dog’s #2s? We purchased Nature’s Miracle Jaw Scoop when we adopted our dog in February. It’s worked great so far. We even left it outside during snow storms and it seems to withstand the elements. (However, over time this may not be the case.) It’s easy to use and we can clean up our backyard fairly quickly. Since adding a second large dog to our crew we are spending more and more time with this activity!! Now I’m really interested in the dog waste composters! Thank you for the information.